The Fabric is normally Nylon Fabric which is coated by rubber and the other side is waterproof. 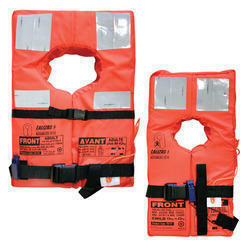 These vests are lightweight with adjustable webbing and a plastic locking buckle. The Jacket has a capacity strength of 2900 N and the overall weight is lessthan 750 grams.